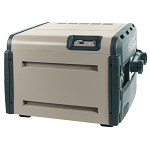 Proper pool heater size is based on the time required to heat the pool or spa. If water is heated for each intended use, energy-saving rapid heating may be appropriate by use of a large 400,000 BTU gas pool heater. If water is gradually heated to the desired temperature and then maintained at that temperature, a smaller pool heater may be acceptable by use of a heat pump or a 250,000 BTU gas pool heater. You must keep in mind that water volume, average air temperature and whether or not you cover your pool must be considered before choosing the appropriate heater for your pool or spa. Heat lost by evaporation will add to the heat-up time. 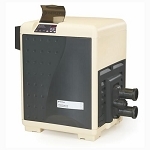 Please feel free to contact us with any additional question regarding swimming pool and spa heat pumps and gas heaters.